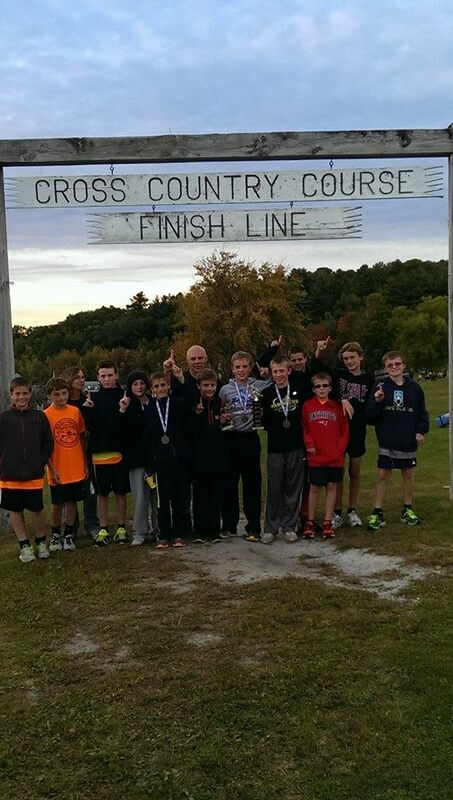 The Deerfield Boy’s Cross Country team successfully defended their 2013 title by winning the 2014 Middle School Manchester Invitational held at Derryfield Park. Last year’s victory was never in question with Deerfield winning by 59 points. This year was a different story. A reloaded Londonderry team, fresh off beating last year’s NH Large School Champion Keene last week, made it a real close one. In the end, 2013 Defending NH Small School Champion Deerfield beat Londonderry 57-60 in a real hard fought battle. Hollis-Brookline placed third with 110 points, Hampton Academy 4th 129 points, Rundlett was 5th with 188 points, and Elm Street was 6th 243 points. Deerfield’s Forest MacKenzie ran all alone for a wire to wire first place finish over the hilly 2.1 mile course, easily winning with a time of 12:14. The battle for second was won by Deerfield’s Ryan Devine in 12:28 just ahead of Merrimack’s Robert Sawdey 3rd 12:31. 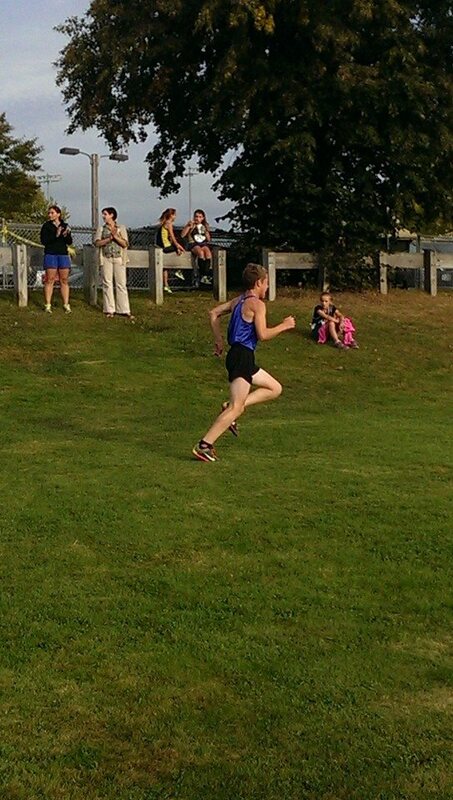 Joe Gagnon of Cawley Middle School took 4th in 12:37 just ahead of 6th grader Matthew Griffin of Londonderry 5th 12:40. Parkside’s Abukar Khamis 6th 12:44 ran a strong second half to beat Londonderry’s Kyle Hoglund 7th 12:45, Hood’s Jeffery Mize 8th 12:53, Londonderry’s 9th 12:57 and Deerfield’ David Cook 10th 13:00. The 2013 Defending NH Large School Champion McGlaughlin girls made it look easy on way to 63 point victory. McLaughlin scored 55 points, to outdistance Merrimack 2nd 118 points, Londonderry 3rd 122 points, Hillside 4th 134 points, Hollis-Brookline 5th 160 points, while Deerfield and Hampton Academy finished in a tie for 6th with 172 points. Individually Kay Partridge of Hollis-Brookline took the lead early and never relinquished it, placing first in 13:20, over a pair of McLaughlin runners Jordan Vaillancourt 2nd 13:31 and Morgan Nault 13:34. 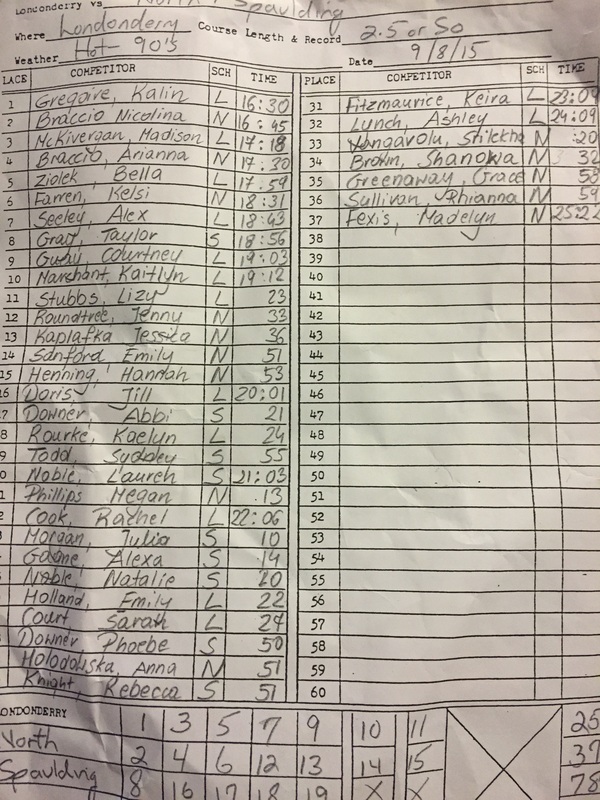 Merrimack’s Sophie Kim 4th 13:34, Hillside’s Katelyn Pepin 5th 13:46, Merrimack Lauren Brennan 6th 13:47, Hillside’s Keegan Pepin 7th 13:50, Elm Street’s Grace Jones 8th 13:53, Parkside’s Julia Robitaille 9th 13:54 and Addison Cox 14:02 of Northwood rounded out the top ten.